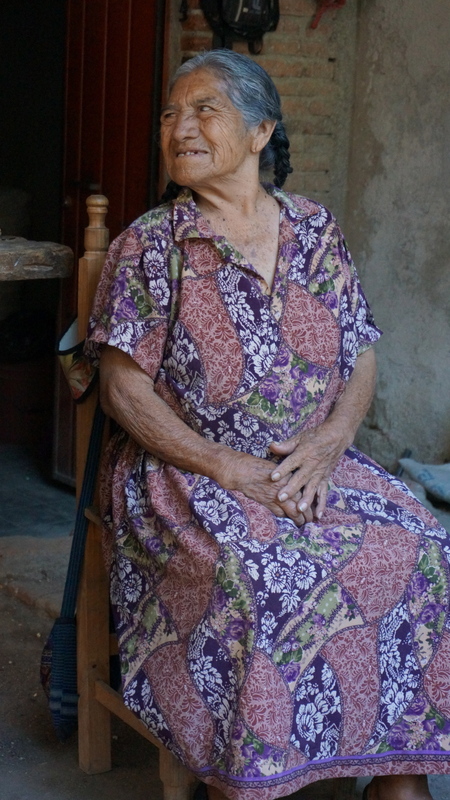 En Via is an organization developed for the assistance of women in the Oaxaca area. Most of them have the skills, the work ethic and the desire to assist their families, and in Mexico your community is part of that. What they lack is any financial assistance. Loans are available everywhere here, but at astronomical rates, and rarely available in small amounts to women. 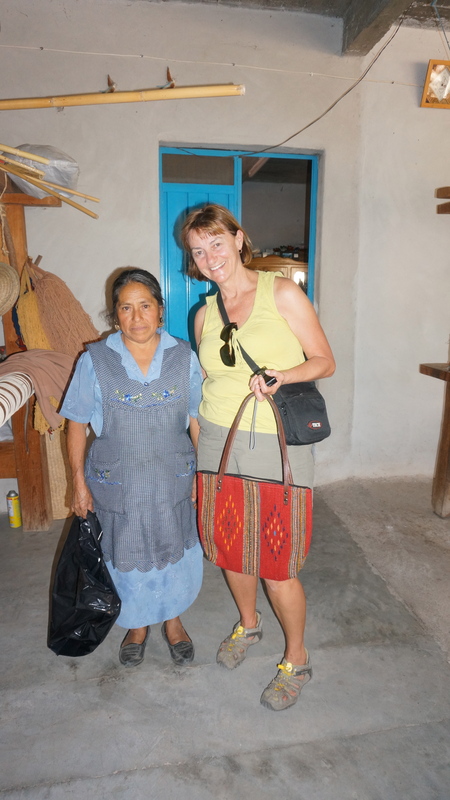 En Via has a simple philosophy of assisting these women in rural villages. In order to receive their first loan of 1500 pesos they must form a group of 3. All 3 women would be eligible for the loan. The reason for this is that it provides a simple screening tool. The women in a village know each other, and who to trust. The first step is attending a business class – where they are taught simple business economics, like keeping business money separate from household money. Filippa has lived with her husband’s family ever since marrying 28 years ago – she has now started on a sewing business on a treadle sewing machine (with loans from En Via) to supplement the weaving income. They might only sell 3 or 4 rugs per month. The entire time Filippa was giving us her demonstration her mother in law sat on the floor, shucking the driest looking corn you have ever seen – to be ground into maize for their tortillas (which they also sell as a business). Chickens and turkeys were hopping around the yard, in the shade of a pomegranate tree. 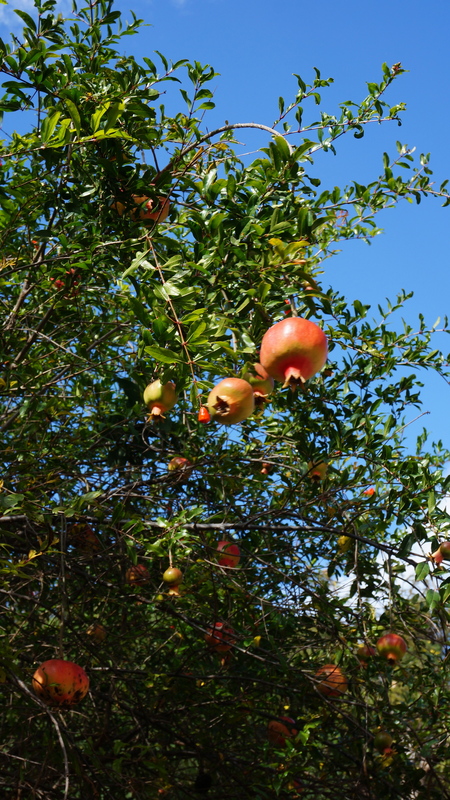 Pomegranates – in season right now, and plentiful! 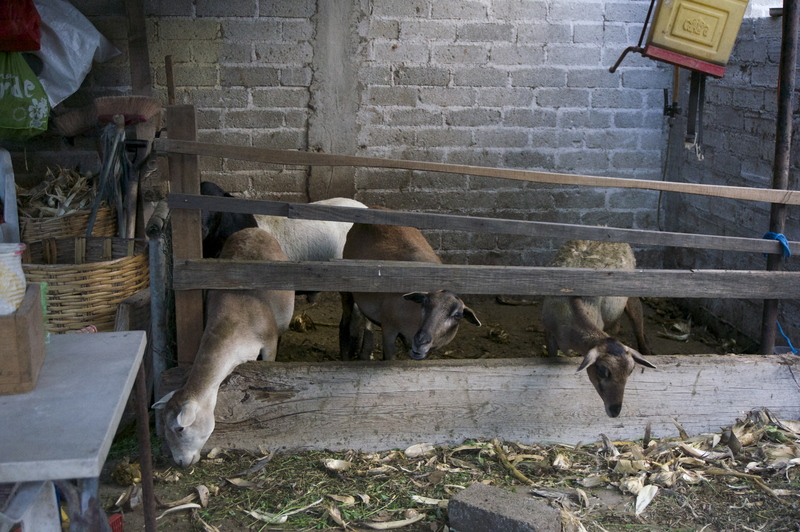 Once they have received their money – an En Via rep comes to take a photo of them with the supplies they have purchased. Once a week they are required to come to a meeting to discuss their business and to make a payment. They can pay it back at either a rate of 10 weeks or 15 weeks, but they must make a small payment each week. Vivian bought a purse from the second lady we visited. 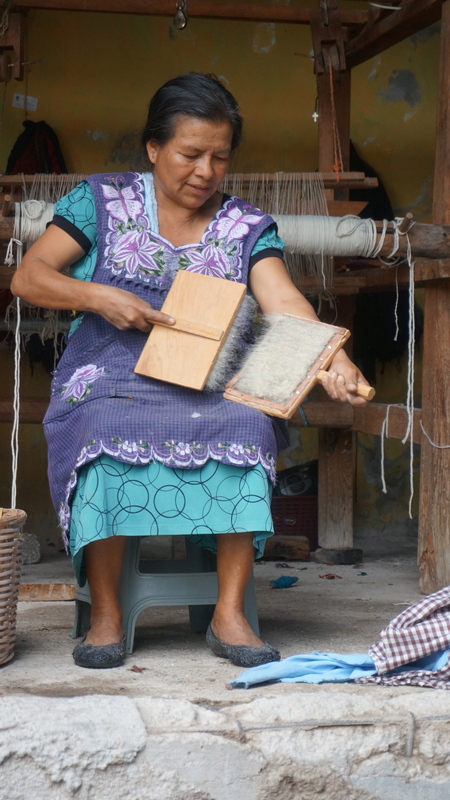 all of their weaving was beautiful – so artistic. Rarely it is on pattern – the designs just flow out of their head and into the yarn. Once they have completed this initial lending process, and paid it all back, they are eligible to move on to other loans – always in groups of 3. Eventually they are able to make larger loans, and those have an interest rate associated. We visited 6 women in their homes, to learn about their business, 1 restaurant, 3 weavers, 1 grocer and 1 sheep/goat raiser. Learning just how challenging it is to card the wool – a real workout. Most of them were on anywhere from their 3rd to 5th loan with En Via. They are such hard workers. The grocer, for example, works her grocery store from 9-5, then her family owns a billiard room – where she works from 6:00 – 2:00 in the morning, then gets up and does it all over again! No days off. It was interesting because her next goal is to buy another shelf for her grocery store, with her next loan. I asked about the possibility of donating the funds for that shelf, but they don’t encourage that. En Via is trying to make everything have a good balance, and the women responsible. The weavers demonstrations were great, and honestly – again – such crazy hard work. It might take them anywhere from weeks to months to create a rug ….. but first they purchase the wool from sheep growers living higher in the mountains, then they pick out the burrs in the wool, wash the raw wool in large baskets at the river, with soap plants, beating and rubbing the wool against the side of the basket. Once it has been rinsed well in the river they spread the wool out on the rocks to dry. Then they card it – which really works up a sweat. All colours come from natural sources, either bugs or plants. After all that, they start the work on weaving. Raising goats and sheep in a very small space. Certainly they wouldn’t be able to raise cattle …. En Via does not advertise, their only source of revenue is people who come on these tours – this is what provides the resources for the women – so if you know ANYBODY coming to Oaxaca, please spread the word! On our way back we got out of the van and got caught in rainfall, so by the time we got to the restaurant we were once again those drowned rats eating at a beautiful restaurant …… Wilson thinks we might start a new fashion trend ….. 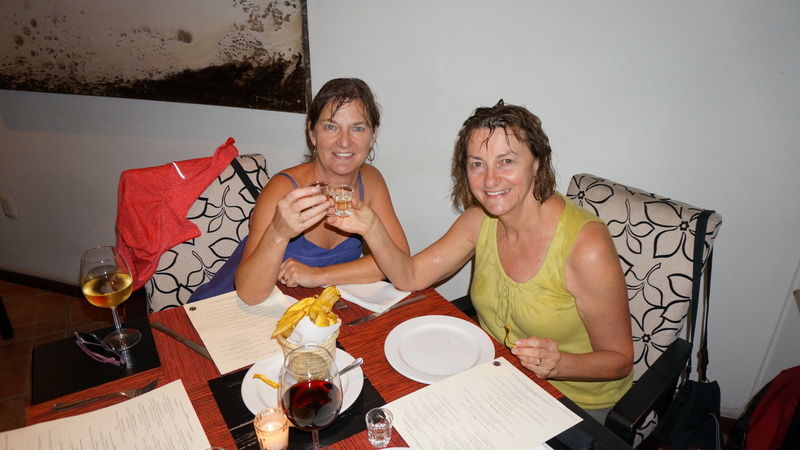 Yes, drowned rats – they no sooner seated us than we had shots of mescal in front of us ….. I don’t think we look THAT bad …. Time to pack up when we got home and head to the beach! 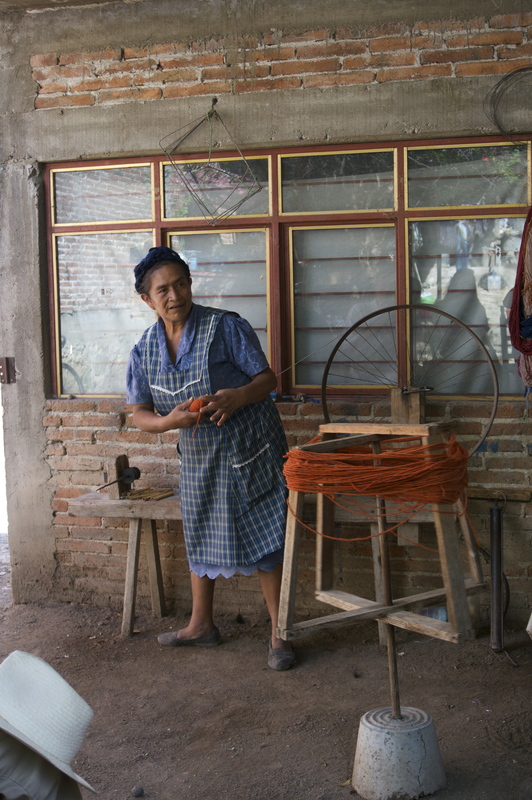 This entry was posted in Mexo, Travel and tagged En Via, Mexico, Oaxaca, travel, weavers, women, Zapotec by Chatty Kathy. Bookmark the permalink.